“Personal stories are boring. 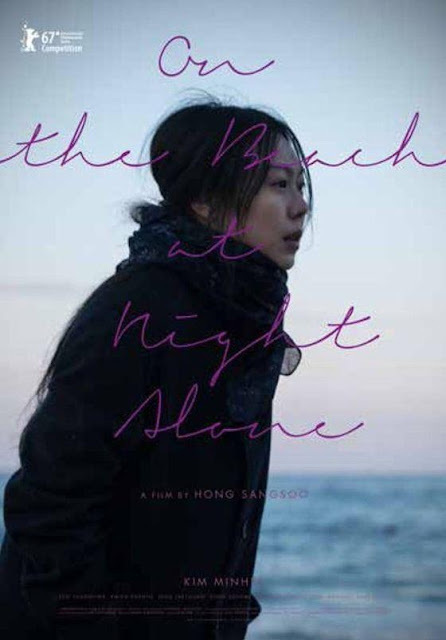 It’s boring to talk about yourself all the time, isn’t it?” says so a character in the prolific South Korean auteur Hong Sang-soo’s latest archetypal drama On the Beach at Night Alone (2017). This self-deprecating line of dialogue playfully pokes at the undeviating boundaries of Mr. Hong’s filmic universe, which could be defined as ‘achingly personal’, unearthing different variations of the characters’ existential malady. Oft compared with connoisseurs of personal cinema Eric Rohmer and Woody Allen, Hong Sang-soo ostensibly spontaneous narrative style, for better and worse, focuses on the myriad possibilities of perception within our alleged simple, quotidian life. On the Night at Alone is Mr. Hong’s 18th feature film in his 21st year of film-making, and barring few earlier works, the director has been remarkably consistent in repeating a set of visual and thematic tropes, which nonetheless forges vigor and profundity. If closely scrutinized despite his penchant for repetitions, one could find interesting fluctuations in Hong’s works over the years, especially in terms of mood. While the director’s recent films saw a shift towards light-hearted and humorous notes, On the Beach at Night Alone retains a melancholic, if not a slightly acerbic tone. The narrative eschews Hong’s trademark split narrative and is replaced with two asymmetrical acts, both acts shot by different cinematographers. In the first twenty five minutes, the narrative depicts the autumnal sojourn of a young Korean woman Young-hee (Kim Min-hee) at an unidentified city in Germany. She spends time with an old friend Jee-young (Seo Young-hwa), strolling through parks and shops, and riffing on desire, relationships, uncertain future, etc. Jee-young, contained within the bubble of loneliness, talks of her failed marriage and the maddening lack of desire. Her visiting friend also seems to be afflicted by inner torment, but Young-hee’s beautiful face better masks her emotional scars. Young-hee says her lover, a married man, may soon pay her a visit. But it never happens. The second, longer part of the narrative sees Young-hee drifting back to the chilly beach-side town of Gangneung, situated on South Korea’s east coast. She meets old friends and has long, liquor-soaked, delightfully frank conversations about feelings of love, self-loathing and despair. There we learn that she is a renowned actress and that her affair with a director has nearly ended her professional career. Every gesture and lines delivered, as usual, appears spontaneous, which is truly a testament to the precisely controlled direction of Hong Sang-soo. The funny highlight of the film is Young-hee’s interaction with a buddy named Myung-soo (Jung Jae-young) at a coffeehouse. And, the firm emotional highlight of the narrative is the actress’ drunken confrontation with the director/ex-lover (Moon Sung-keun) which gracefully moves between self-deprecation and self-parody. Understanding the self-reflexive, Meta nature of the narrative may help one appreciate the ineffably sad setting a little more. Hong’s meditation on love in On the Beach at Night Alone is deeply personal, considering the intensely publicized affair between the director and Kim Min-hee (ever since they collaborated for ‘Right Now Wrong Then’ in 2015). Riled by local media, the Hong and Kim came out earlier in the year to confirm the speculations (he initiated divorce proceedings with his wife of thirty years). Later, there were subsequent reports claiming that they’d ended their affair.“Why stir up such a fuss? People must have had fun raking them over the coals……two people in love is immoral?” says a character in the film, empathetic to the lovers’ plight. Later in the dreamy conversation scene, the director character remarks, “I need to cast off my regrets.” Although formally and structurally, the film isn’t Hong’s best work (‘Virgin Stripped by her Bachelors’ & ‘On the Turning Gate’ are my favorites), this kind of honest self-critique poses intriguing queries and may delight the auteur’s fans. While Hong tries to exorcise his inner torments through the actor film-making, his fastidious style also provides an interesting study of our myopic view of love and the constant drift towards self-entrapment. Hong Sang-soo has always been reluctant to discuss the meaning of his work, its moral dimensions or about the origination of his ideas. In one of his rarest interviews (to National Post) when asked about the creative process, he coolly replies, “I only respond to what is given to me at the time I set out to make one, such as actors, locations, weather, as well as what I see, what I read, what I recall, and what I hear during the pre-production and production period, with what I call “my best innocence.”” The words pretty much sums up the obscure yet poetic nature of his form and content. With a switch to digital, Hong’s rate of working has escalated greatly (released three films in 2017) yet his craftsmanship continues to devise deceptively simple conversations and metaphorical representations that somehow slowly digs deeper into our heart. In this film, couple of sequences was memorable for me: tender gaze on Kim’s Young-hee when she smokes and sings outside the cafe in the wintry day; and when Young-hee lays bare her emotional pain that’s punctuated with reckless drunken behavior. Formally, the beach proves to be a curious setting. Hong’s unglamorous shots of beach turn the spacious setting into a circumscribed setting, only to elevate Young-hee’s isolation. Director Hong once again employs mysterious, playful notes in the narrative: for example, the mysterious abductor or the man at hotel balcony and the stranger in the park. The other trademark element employed is the zooms used during long takes (unmotivated and at times seems intrusive). Kim Min-hee has by now become adept at playing characters withholding dark emotional undercurrents, occasionally erupting with casual ferocity. She makes Young-hee’s longing for alleviation and evasion much more deeply affecting. With “On the Beach at Night Alone” (100 minutes) celebrated ‘minimal realist’ Hong Sang-soo blends his pet theme of existential disquiet with his personal affairs to a much deeper degree than usual. The result is a part insightful and part inept study of life’s uncertainty and futility of love.